The Complete Family Guide to Jewish Holidays Not truly a dictionary, this is really an alphabet book introducing the 22 letters of the Hebrew alphabet. Each letter is given a double - page spread, divided into 12 blocks that show the letter and individual pictures of words that begin with that letter. The word appears in Hebrew with the phonetic Sephardic pronunciation and the English translation. The words are all everyday objects familiar to the child. The illustrations are in full bright colors, in a bold style reminiscent of Brian Wildsmith. This is a beautiful book that will enhance juvenile foreign language collections. A Mouse in Our Jewish House The book that best suits this opening of a new Jewish year is a counting book of Jewish holidays, A Mouse in our Jewish House. This survey of Jewish holidays focuses on Archie Akbay (aka Archie the Mouse) whose appetite for Jewish holiday foods increases through the year from one bite of Shabbat challah to 12 corners of Shavuot blintzes. By David A. Adler Highlights the Sabbath, Rosh Hashanah, Yom Kippur, Sukkot, Simhat Torah, Hanukkah, Tu Bi-Shevat, Purim, Passover, Yom ha-Azma'ut, Shavuot, Tishah be-Av, and other Jewish holidays. Beginning with the a Jewish calendar which is based on the moon, and comparing it to the Julian calendar, readers understand why the dates of Jewish holidays can vary so much each year. That said, the book begins with the Sabbath and Rosh Hashanah and ends with Tishah Be-Av. It also mentions six other holidays and includes a glossary. The book is light on facts as the author notes in the opening, but filled with the feeling and emotions that these holidays evoke. The soft pen and ink illustrations with watercolor washes convey scenes of families celebrating. The Glass Menorah And Other Stories for Jewish Holidays The Berg family and their favorite neighbor, Mr. Yomtov, observe the annual cycle of Jewish holidays in this collection of appealing stories. Each brief tale incorporates the customs and meaning of a particular holiday. Rich with caring relationships, the uncomplicated plots pivot on just enough tension or suspense to intrigue young readers and listeners. In one story, 10-year-old Abby is crying because she's locked herself out of her house and can't retrieve the apples she needs for her class's Simchat Torah celebration. Mr. Yomtov comes to the rescue by walking Abby to an apple tree in a nearby meadow. Mr. Yomtov saves the day again in the title story when the Bergs' cat knocks over the new glass menorah Uncle Mark sent from Israel. Mr. Berg glues the pieces back together again, and Mr. Yomtov paints grapevines and fruit, camouflaging the scars and restoring the menorah's beauty. The unpretentiously informative, warm, and gently touching stories are independently pleasing. Av - Elul (Vol 6) Stories for every day of the Jewish calendar. 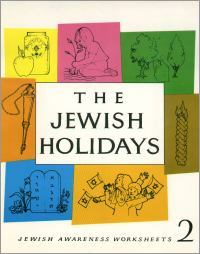 By Yaffa Ganz Teach your young child about all the holidays of the year--from Shavuos to Tu B'Shvat with this information-packed book about the Jewish calendar seasons, holidays, and customs. With endearing, colorful illustrations. By David A. Adler A tempting assortment of mazes, puzzles, brain-teasers, jokes, poems, rebuses, and more... for Shabbat and holidays. Children's Stories for Exploring the Spirit of the Jewish Holidays Sharing Blessings explores ways to get into the spirit of the holidays all year long. Musleah, mother and journalist, and Klayman, father and rabbi, gently give our children the spiritual message and help adult and child explore it together. For 13 different holidays and festivals, there is a story about David and Ilana and their parents - a story focusing on the spiritual value embodied in each holiday. Being afraid of the dark, taking a walk in the woods with Grandpa, arguments between David and Ilana, sharing family photos, helping the community; all become opportunities for learning about how holidays' meanings are related to our daily life. Each story concludes with a special prayer, a blessing that child and adult can share to bring the spiritual meaning of the holiday into their own lives. By Greer Fay Cashman With a minimum of repetition and a generous amount of examples and stories, Cashman provides a lucid overview of the traditional Jewish holidays as well as Israel Independence Day, the Ninth of Av fast and the Sabbath. Her approach is refreshingly pluralistic ("Not all Jews celebrate the Sabbath exactly alike"). Sidebars highlight various symbols, including the Passover seder plate and the Sukot etrog, or citron. Frankel's brightly colored graphicschunky children dancing with Torahs, plump Chanukah jelly doughnuts, curly coated sacrificial lambsdelightfully enliven a serious subject and convey the joy of the Jewish holidays. By Yaffa Ganz Join Bina, Benny and their winged friend, Chaggai the holiday dove, in these fun-filled adventures explaining the background and observance of the Jewish holidays. Illustrated in full color by Liat Benyaminy Ariel. By Sharon Eichenbaum, Alice Goldin, and Michael Korman Cut, paste, color, play, and draw your way through the Jewish holidays with these lively activity sheets. 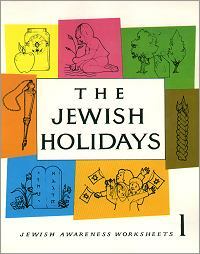 Includes Synagogue, Israel, Tu B'Shevat, Purim, Pesah, Shavuot, Jewish Symbols, Lotto. By David Sokoloff Colorful Board Book with a rhyming page for each holiday. Fun for every toddler. (Vol. 1) There exists today a seriously unfulfilled need for creative tools in Jewish Education, particularly for well made and effective illustrations of Chinuch objects and concepts. We are grateful to Mrs. Esky Cook for her devoted efforts to meet this need. Blessed by Hashem with quite extraordinary talent, she has dedicated this gift to the service of Hashem and the educational needs of the Jewish people. This devotion and these efforts have produced a series of books that depict Mitzvos and Midos Tovos in vivid and eye catching illustrations that will surely be of benefit to teachers and parents alike in the elevation of students and children of all ages. It is with great pleasure and anticipation that I recommend this series of reproducible artwork by the supremely talented Esky Cook. Esky has completed the monumental task of culling an exhaustive collection of wonderful clip-art, reflecting pure Torah values and child pleasing charm. The response of teachers, students and parents to this series is sure to be uniformly enthusiastic with people clamoring for more. All of us who are dedicated to providing our children with the finest learning materials possible to enhance their love of Limudei Kodesh and Midos Tovos are deeply in her debt.